Quirky. Different. Special. Words often used to describe this fascinating Derbyshire town on the southern edge of the Peak District, where the geology and landscape have shaped its character and its people for generations. Lead was being mined here in Roman times, and by the 12th century it was one of the most important centres for lead ore in England. By the 19th century lead was all but exhausted and limestone quarrying provided new work for the town’s inhabitants. Wirksworth also became the biggest producer of red tape for Whitehall, its weekly output equalling the circumference of the earth. George Elliot, in her novel Adam Bede, based her fictional town Snowfield on Wirksworth and the character Dinah Morris on her aunt, who lived in the town. D.H. Lawrence lived with his wife Frieda on the outskirts of Wirksworth and whilst staying here in the bitter winter of 1918–19 wrote the short story A Wintry Peacock. Over the centuries, quarrying changed the landscape of the town dramatically and mechanisation brought dust, dirt, and noise. People moved away and took their trade with them, leaving buildings empty and falling down. But the Wirksworth Project – a remarkable and European award-winning regeneration programme – changed all that, transforming the crumbling buildings and recreating a thriving community once again. 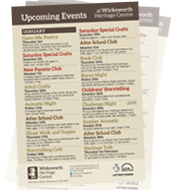 Wirksworth is now known for its independent shops and cafes, annual arts festival, bustling music scene and for the dozens of artists and creative people who live and work in the town.